Dr. Cho has been practicing dentistry at the same location in La Mirada for 20 years. 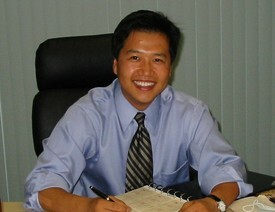 Dr. Cho is a graduate of the prestigious USC School of Dentistry, where he served as a clinical instructor. In addition to many years of experience, Dr. Cho has certifications in Invisalign, Dental Implants, and Cosmetic Dentistry. He is also a member of many notable dental associations such as the American Dental Association, the California Dental Association and International Congress of Oral Implantologists. Currently, Dr. Cho is serving as Assistant Professor at Western University College of Dental Medicine. Dr. Cho’s other passion is spending time with his family, which includes his wife, Grace and his kids, Samantha and Sean. He also enjoys playing bass guitar and going to movies.